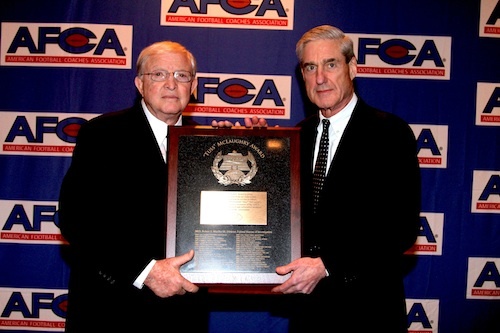 Grant Teaff (left), executive director of the American Football Coaches Associaton, presented the Tuss McLaughry Award to Director Mueller. 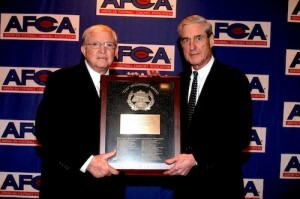 FBI Director Robert S. Mueller III on Tuesday night received the Tuss McLaughry Award from the American Football Coaches Association in Nashville. The award, established in 1964, is the organization’s highest honor and is presented to distinguished Americans in recognition of outstanding service to others. “Coaches are parental figures,” Mueller said during the ceremony according to information posted on the FBI website. Posted: 1/10/13 at 10:01 AM under FBI, News Story.